Every cat owner know the scene, you come home after a long day of work and you are greeted by the friendly meows of your feline best friend. Throughout the day (and night) you cat will try to communicate with you, meowing is a cats way of talking. But we might not always understand what they are trying to say. 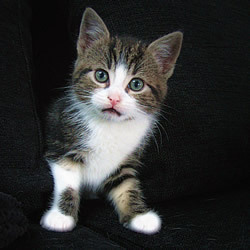 We humans use different words to talk to each other, cats use different pitches and variations of meows to communicate. But its not very hard to understand what your cat is trying to say, all you have to do is recognize and set apart the different meows your cat makes. To fully understand your cat, you should not only listen to a cat’s meow, but also watch a cat’s body language. We’ve set apart the different types of talk in cats and what your cat means with each meow. Some cats meow more than others. This is often breed-related but can also differ from cat to cat. And it is also affected by the cats need. If the cat always gets what it wants without having to meow, the need to meow will decrease. If the cat has to meow before it gets what it wants, the meows will increase. Let us know if your cat meows and if you are able to recognize the meows. My last cat RIP pooch was so vocal she never shut up always meowing, but then when i Isabelle she hardly makes a sound.